Hello, Kylee here today. I’m back! See, I told you I was going to try to appear here more often! 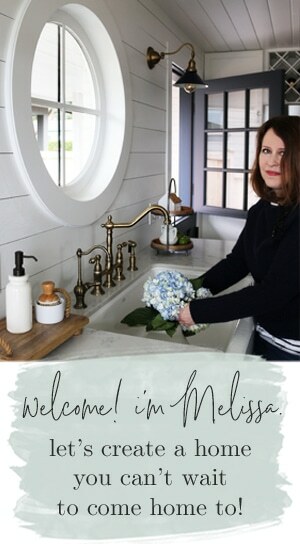 Besides the fact that my mom needed a couple of days off this week to finish up a project, she has been bugging me for FOREVER to post not only my townhouse decorating progress, but also recipes. I assume this is partly for her benefit because she is one busy lady and, as I know she would admit, doesn’t have a lot of time to think about things like meal-planning. I, on the other hand, have a food obsession and my mind is constantly occupied with my next meal. For my mom’s birthday this year, all she asked for was a typed list of easy, healthy recipes that she could make and so I obliged. Contrary to what people tend to think, given how much I love food, I don’t like cooking. What I DO like is eating. But alas, eating well and cooking tend to go hand in hand. One of my dreams would be to have a personal chef who I can tell exactly what I am craving and they would just make it for me and take care of the cleanup. I wish! I am slowly learning to be sort of into cooking. But really, it’s not the process I like, but the end result. Like I explained in my last post, I had been slacking on posting here because blog posts require more time than you would think. Especially because it means that you not only have to write something somewhat interesting about what you are posting, but you also have to take photos. Taking photos requires one to be home in the light and then the expectations with a blog post is that you take GOOD photos, which let’s be honest, I am not a photographer and never have any idea what I am doing when I whip out the DSLR. So, I explained all of this to my mom, who in turn told me not to worry and just share my photos like I do on Instagram. If you follow me on Instagram, you may have noticed I take a lot of photos of my food. Yes, I’m one of those people at restaurants. Before you go judging me, you should know, science totally validates this behavior. 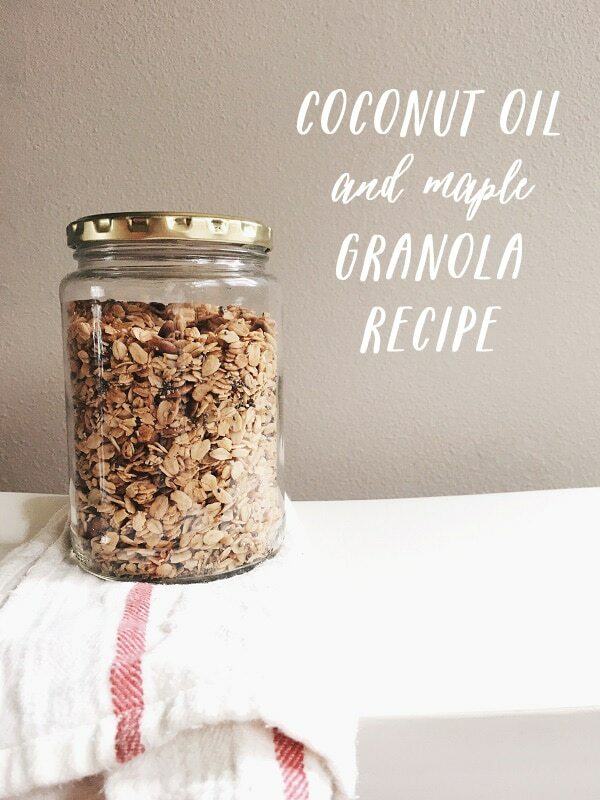 All that to say, I am here to share a granola recipe with you today! 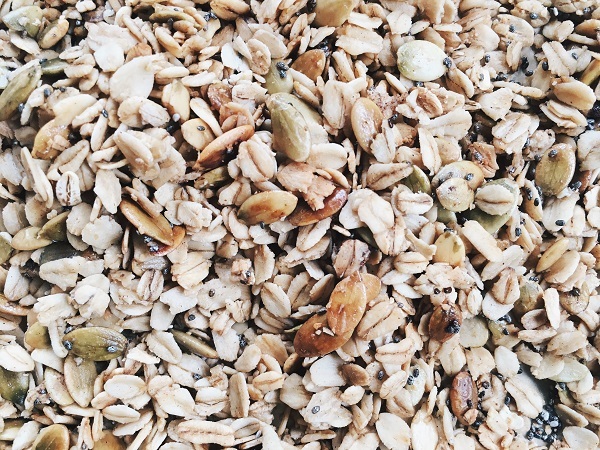 Granola is a morning staple at our house. 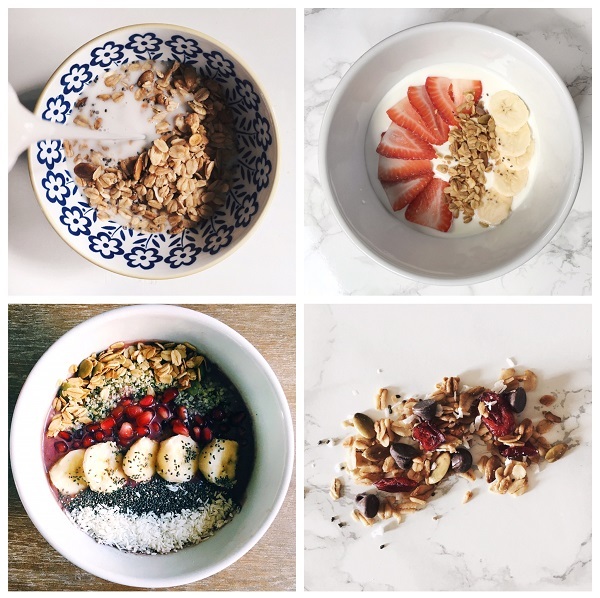 We most often use it to top yogurt or smoothie bowls in the mornings. Occasionally, we will have it like cereal with some almond milk. I’ve even used it as an oatmeal topper! For a snack, we will toss it with nuts, dried fruit, or chocolate chips. Nothing compares to fresh, homemade granola. 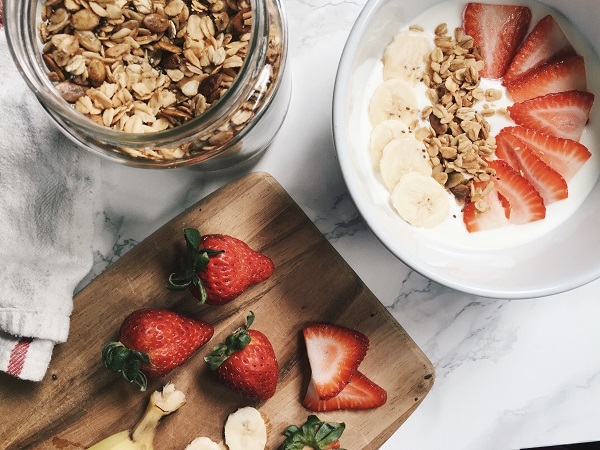 Boxed granola is usually so processed and full of refined sugars and preservatives. It’s so easy to make and tastes so much better than store bought that there’s really no reason not make a big homemade batch yourself! Plus, it lasts for several weeks in an airtight container (not that it ever lasts that long in my house!). This has been our go-to recipe lately. It’s super simple, which makes it very versatile. If you try it I’d love to hear what you think! 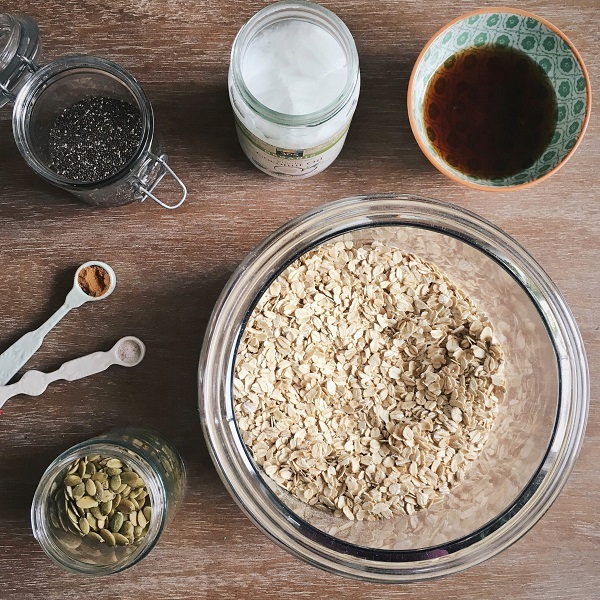 In a large bowl, stir together oats, pumpkin seeds, and chia seeds. In a separate, medium bowl combine melted coconut oil, maple syrup, sea salt, and cinnamon. Combine both bowls and spread evenly onto your baking sheet. Bake for 20 minutes. 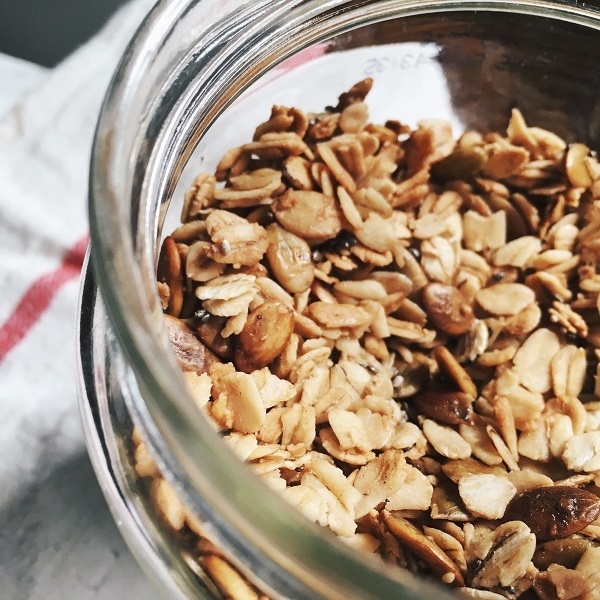 Remove from oven, stir, and bake for another 15 minutes or until granola is golden brown. 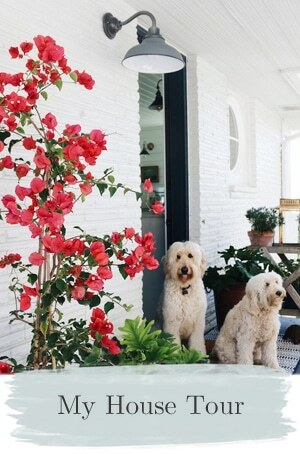 Happy Easter weekend from our family to yours! 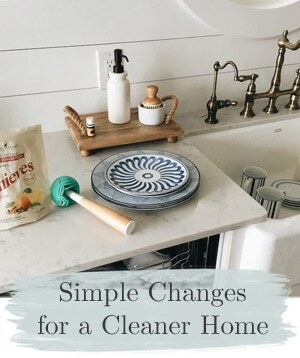 One thing I’ve learned over the years of trying to keep up with several kids and pets in our home is that if you really want to have a “clean enough house” like I do, you need to find ways to be very efficient and make it a habit to clean as you go. It really isn’t any extra work to clean more often, in fact, it’s actually less work to clean as you go than it is to save up all the work until your house is a giant mess. Being prepared to clean by having the right supplies ready to go and then actually cleaning up as you go through the day will make a difference in so many ways! 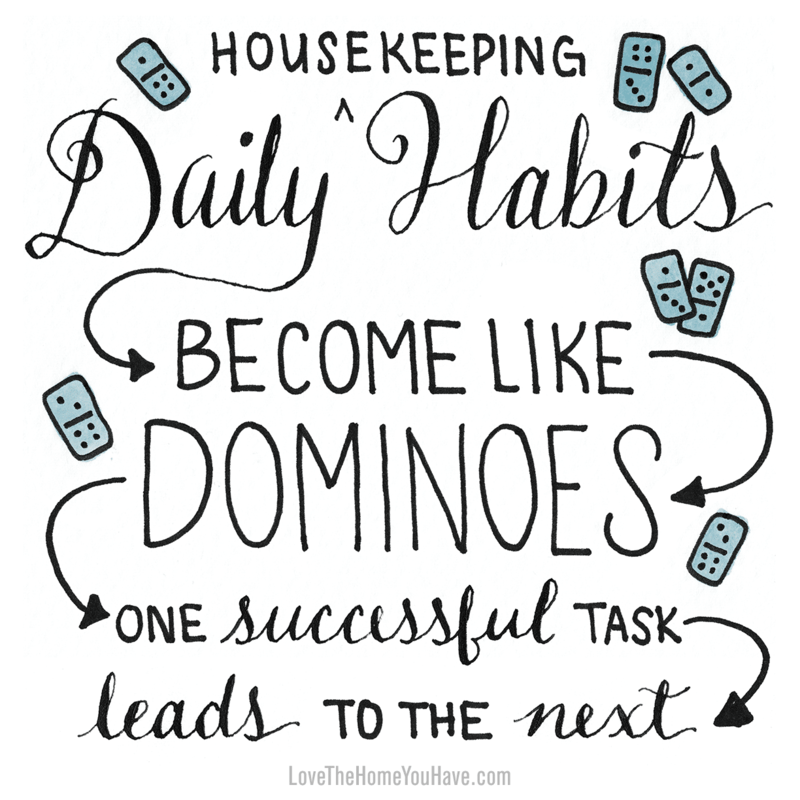 Because I try to keep up with my daily routines for housekeeping, I love having what I need on hand to keep up on washing dishes and laundry, it just makes me feel prepared and efficient. 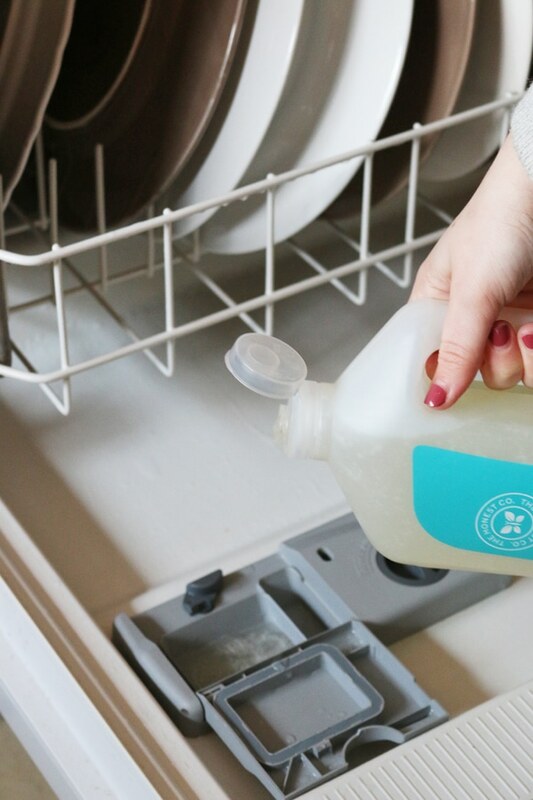 There’s nothing more frustrating than running out of dishwashing detergent on a busy week! 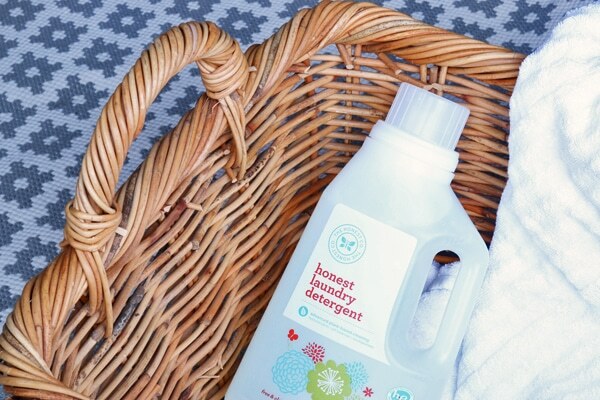 I recently received a bundle of cleaning products from The Honest Company delivered right to my door, it doesn’t get any more efficient than that! The Honest Company products are so adorable and clean smelling and we love the convenience of the service! Honest’s goal is to provide you with a little relief by delivering the family essentials to your doorstep– to simplify your life and bring more delight to every day. They definitely achieved their goal at our house! 1. 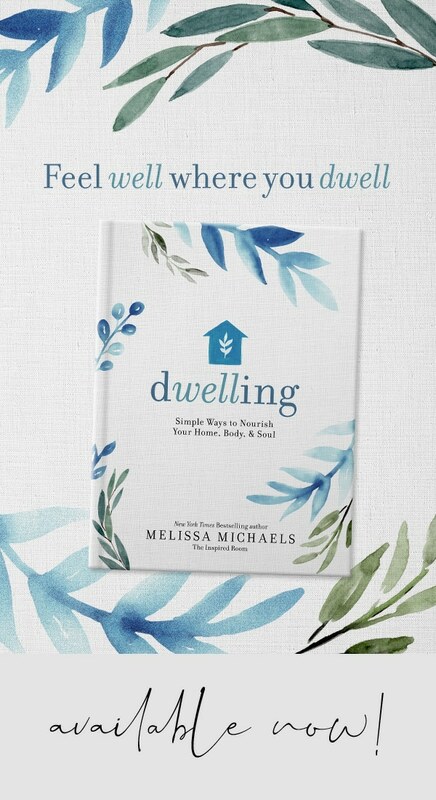 Make it a daily habit to put things away where they belong to save yourself time and stress later. When you see something amiss, pick it up and take it immediately to where it belongs, rather than letting things pile up. Keep a basket near the stairway to toss items that go up or down stairs to save a few extra steps. 2. 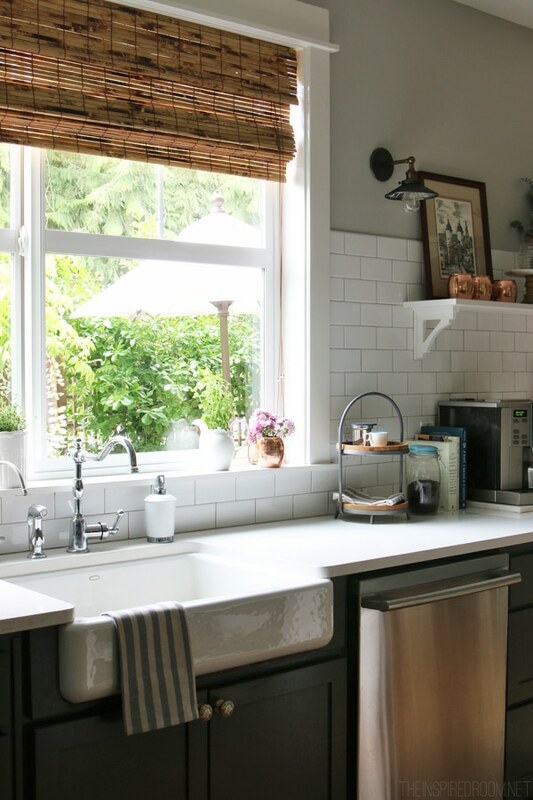 When you see a messy countertop or a dirty sink, take a few moments to clean and polish it up right there on the spot. To make cleaning easier, I keep an all-purpose cleaner and rag or paper towels handy under the sink so I can quickly clean up a mess before it has a chance to grow and multiply. 3. Schedule online deliveries directly to your home for frequently used cleaning items like dish soap and laundry detergent. Always be stocked with what you need to do laundry and dishes so they will never pile up waiting until you can get to the store. I ordered my essential cleaning products in a significantly discounted bundle from The Honest Company (with up to 40% off versus ordering items individually) and they can be conveniently scheduled to ship regularly so you can refill your supply as often as you need without making emergency trips to the store. You only pay when they ship! Orders are obligation free and so convenient! 4. Empty the dishwasher before you start cooking. With an empty dishwasher, you’ll be able to put your cooking and dinner dishes immediately into the dishwasher after dinner and go to bed with a clean and shiny kitchen. 5. Wash dishes after every meal. Yes, at first it will seem as though you are always doing dishes. 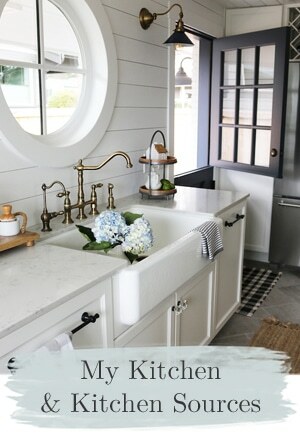 But the alternative is dirty dishes piling up in the sink and all over the counter all day long. 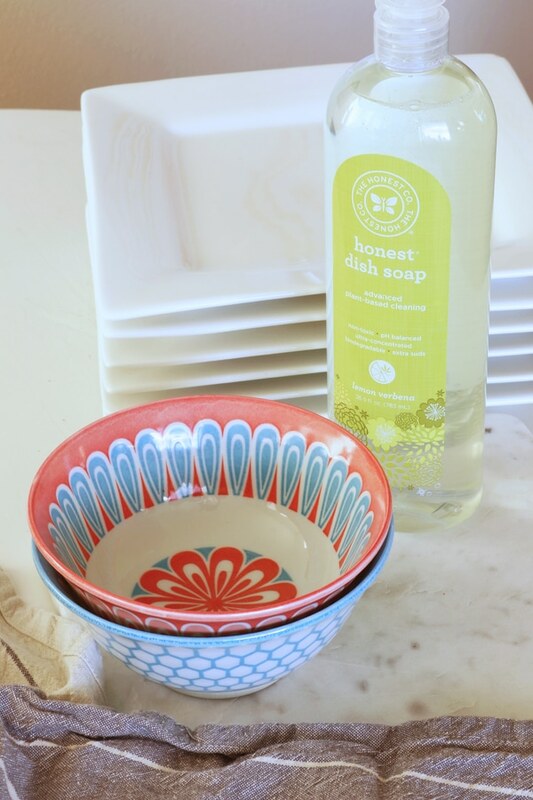 I personally love using the Lemon Verbena Dish Soap and the Honest Auto Dishwasher Gel. They are tough, but smell great and are safe for your family and home with advanced plant-based cleaning. 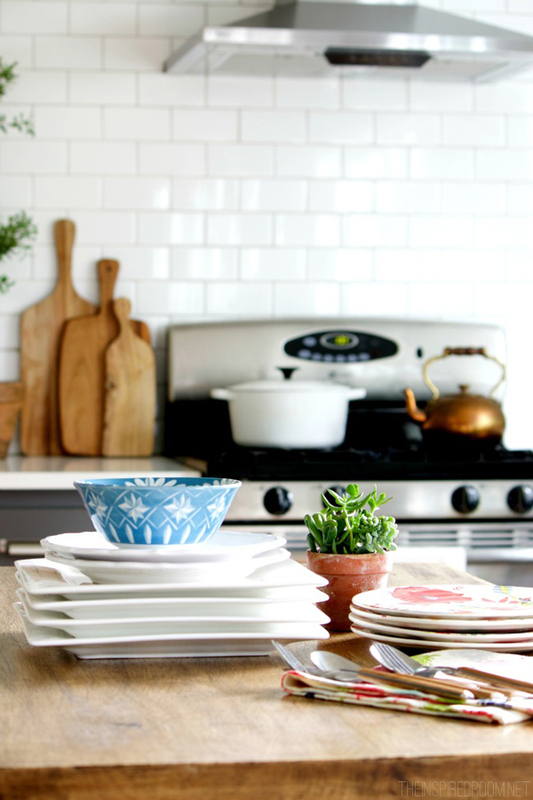 Keep up with the dishes and soon you’ll become accustomed to a clean kitchen and never want to go back to letting dishes pile up again. 6. 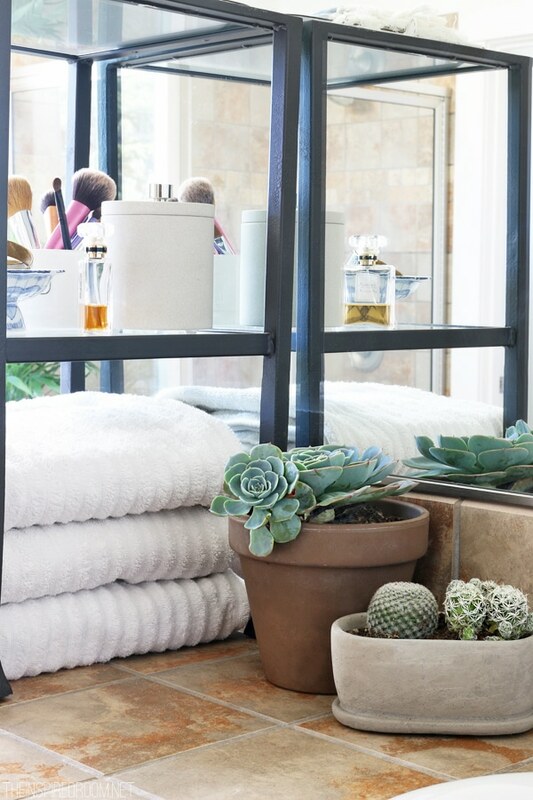 Keep cleaning supplies in every bathroom for quick and easy access. With easy to grab cleaners and towels you can quickly polish up a sink and with toilet wands available you can easily swish out a toilet. If you have to go to another part of the house to grab supplies first, you’ll be more likely to put off cleaning or simply forget to do it. 7. Toss in a load of laundry in the morning, move it to the dryer and use a timer to remind yourself to remove items and immediately fold, hang and take to the proper location. Keep laundry moving along and you’ll avoid ironing and laundry pile ups. What are your favorite clean-as-you-go tips? 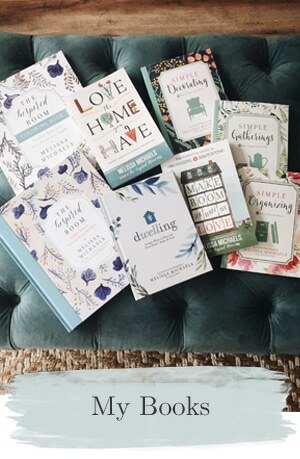 Honest was kind enough to offer the first 25 readers 25% off their first Honest bundle! Click here and use the code INSPIRED25OFF at checkout!